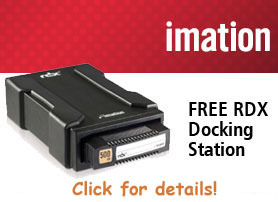 Imation’s RDX® Removable Hard Disk Storage System makes data backup easier, faster, more reliable and more secure. Its enterprise-class features provide the data protection of large IT data centers, so it can support companies as they grow, and all at an affordable price. The Imation RDX Storage System is designed to reliably protect business’s valuable assets. It uses a rugged, reliable removable disk cartridge and docking station that backs up just like a tape drive. Yet its speed makes it a smart replacement to DDS/DAT, VXA and DLT performance tapes. 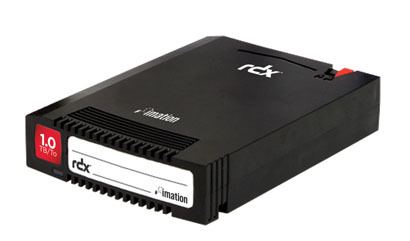 In fact, the Imation RDX Storage System is able to back up to 150GB of data per hour and allows near instantaneously file access. Cartridge capacities range from 160GB to 1TB, making storage options extremely flexible. And you’ll never run out of storage space. Simply add more removable cartridges as your data needs expand.